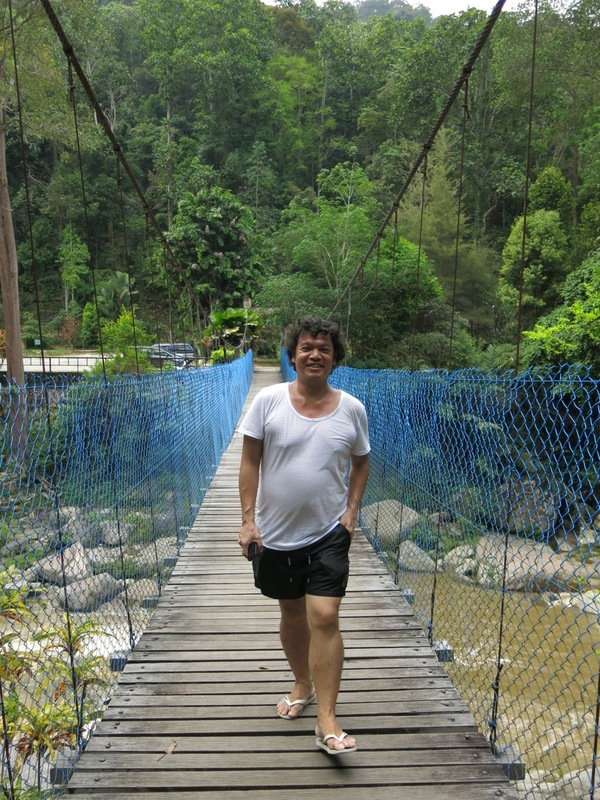 I had often rushed through Bentong on my way to and from Merapoh for my CATwalks but until now I had never really stopped, except for ice cream at Kow Po. 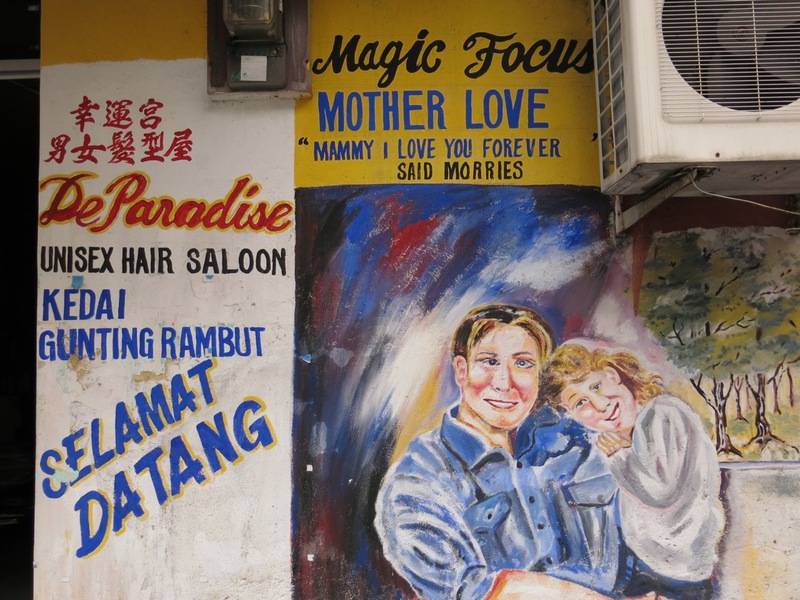 The two main streets, Jalan Loke Yew and Jalan Ah Peng, I had only glimpsed fleetingly from behind a steering wheel. Its old heritage buildings and coffee shops had continued to intrigue me. I plotted to discover more. 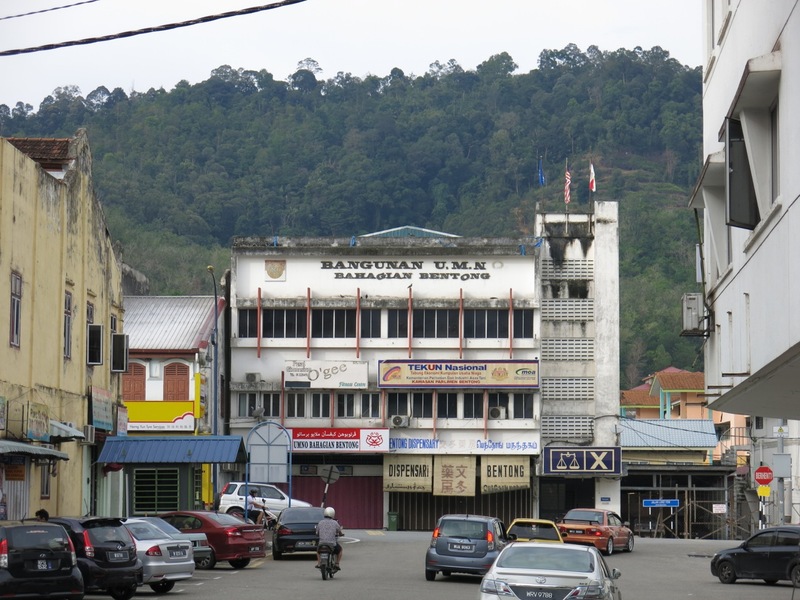 Bentong’s Pasar Besar wet market. Conspiring with my partner-in-crime, Richard, we arrived at 9.30am on a cloudy Thursday and on the advise of Motormouth from Ipoh, whose blog I frequently reference, we headed straight for Bentong’s wet market (Pasar Besar Bentong). 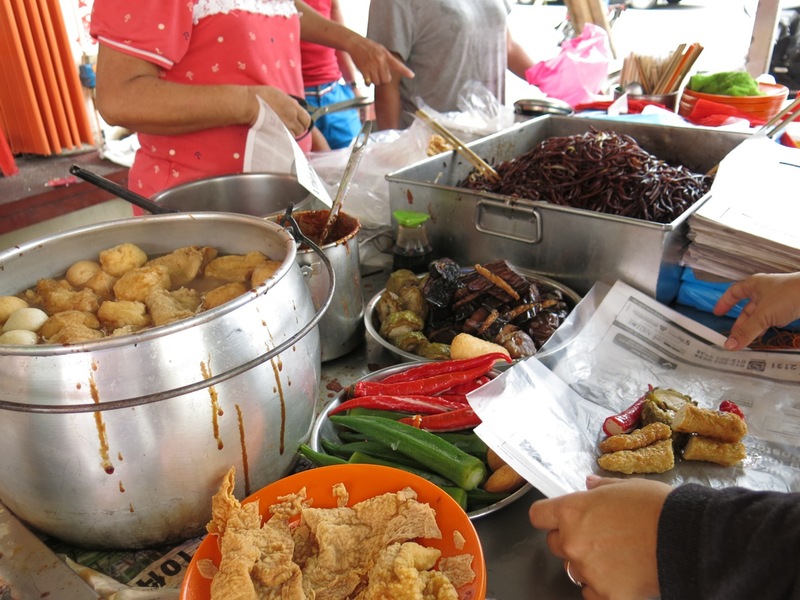 The smell of meat and poultry put me off heading inside but outside stalls selling fresh produce – ferns, sweet potato leaves, ginger and fish still flapping around in pools of water – lined the street. 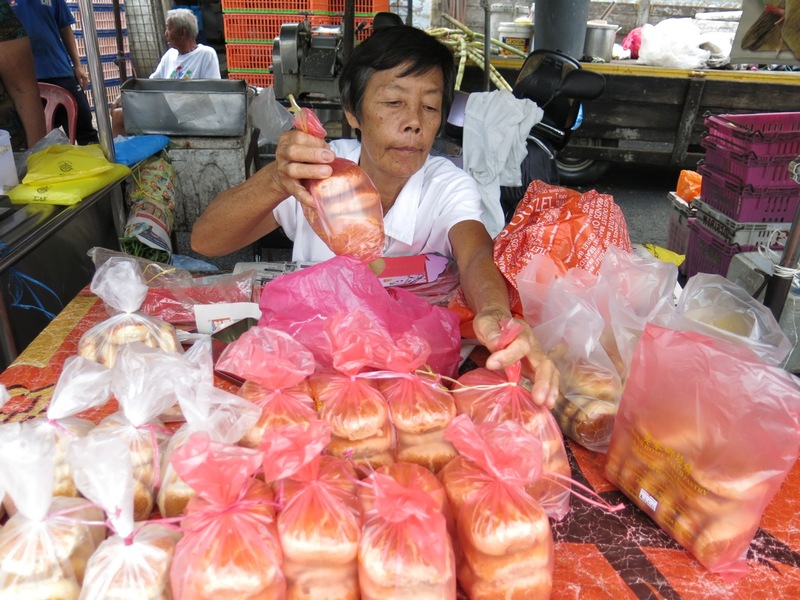 Mrs Mok and Mokie’s homemade pineapple and kaya puffs – one bag is simply not enough! We wanted to try Bentong’s famed pineapple puffs and made straight for the stall around the back. Still warm from the oven, we bit into the warm envelopes of pastry and into the sweet fibrous pineapple filling. 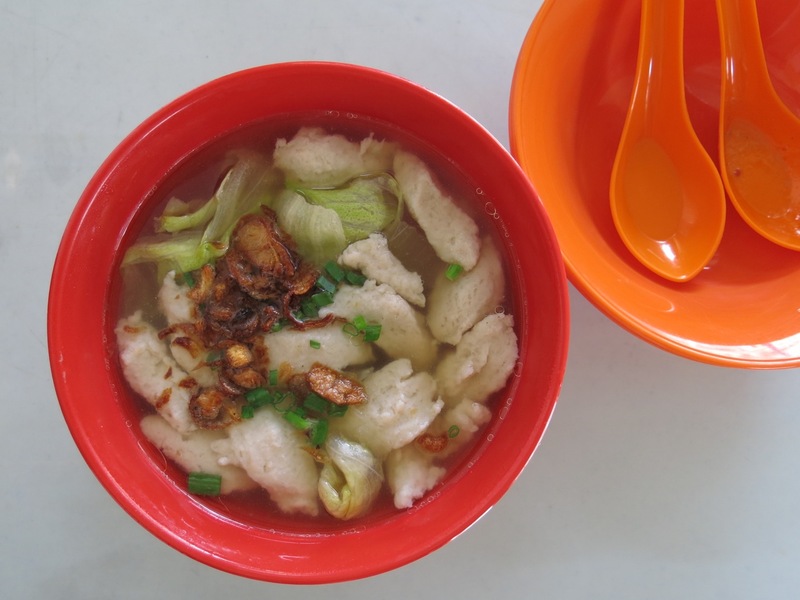 What a deliciously perfect start to our Bentong crawl! 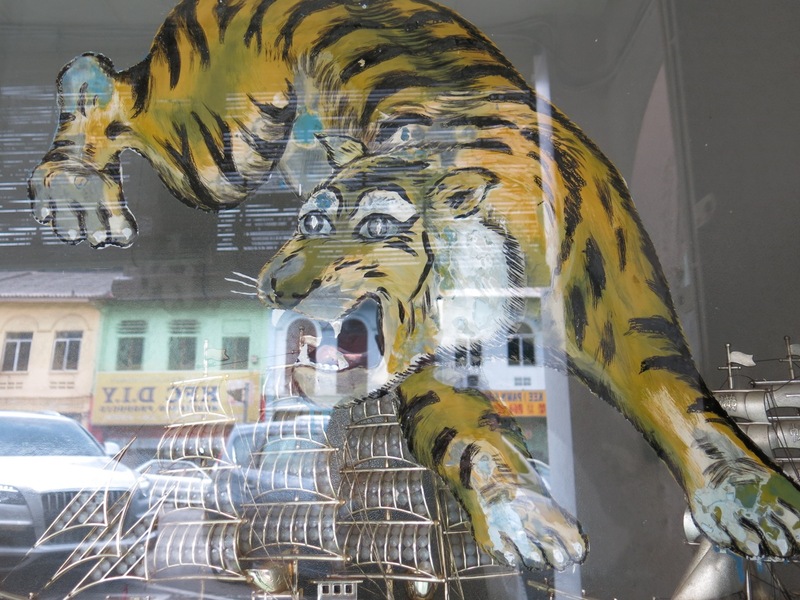 The tiger motif has me very curious about what kind of medicine is dispensed inside this clinic. 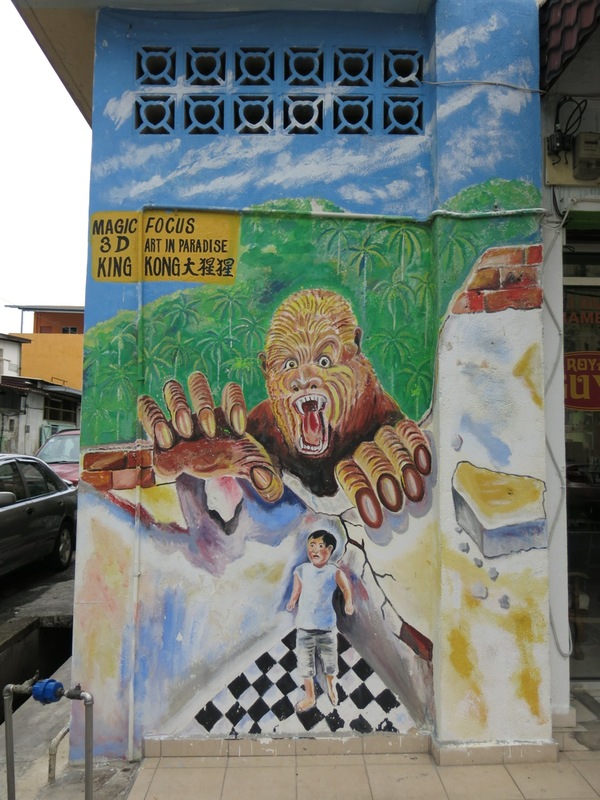 Bentong had been built on tin mining and rubber plantation money; our plan was to get familiar with the Old Town and explore its five foot ways and alleys. I love the digital aspirations of this…. 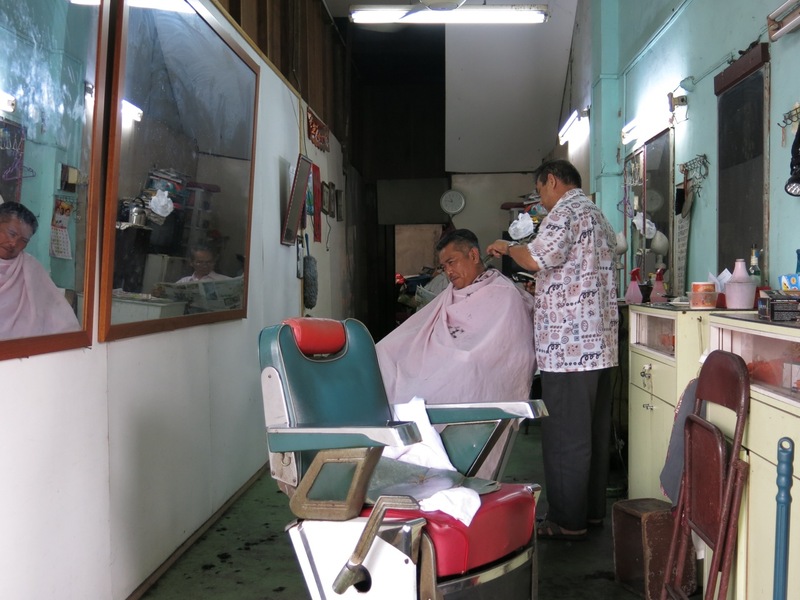 As we wandered the streets, we snapped photos of the pre-war architecture and curiously peered into the sundry shops and services – barbers, hairdressers, dentist and traditional medicine clinic, kopitiam and tai chow eateries. They just don’t make them like this anymore…. A great use for old CDs. 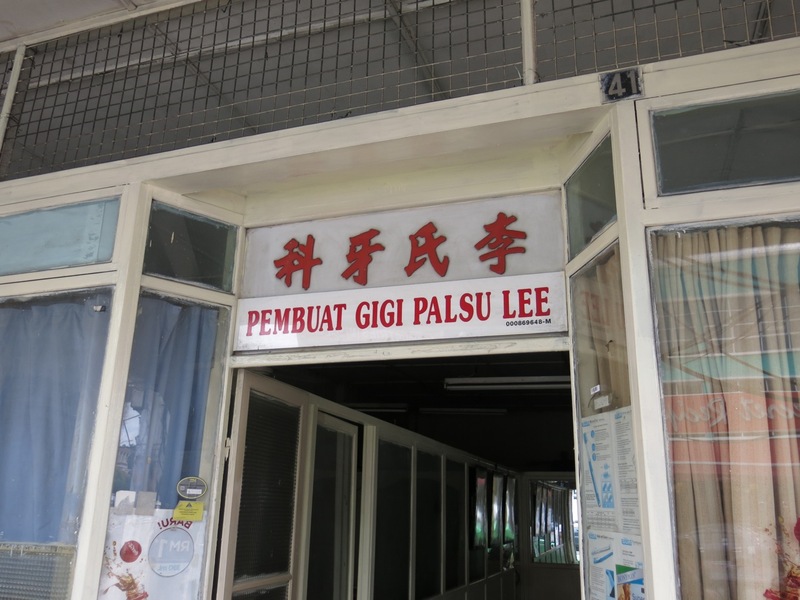 Populated by predominantly Chinese from Guangxi, one thing that became apparent to us is the number of clan associations located in Bentong. 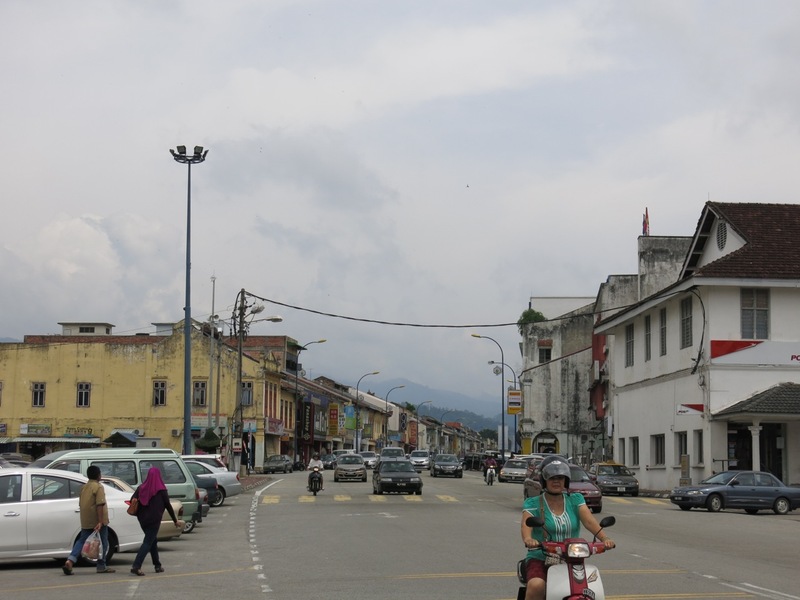 From Hakka to Huang, to those devoted to Kochau and Lee clansmen, and various associations for Chinese youth, traders, you name it, Bentong is home to it. By now desperate for coffee, we headed for Cheong Fatt Coffee Shop, a kopitiam that does the most amazing iced coffee, and since breakfast was overdue, half boiled eggs and toast for good measure. Richard, the kopitiam proprietor. 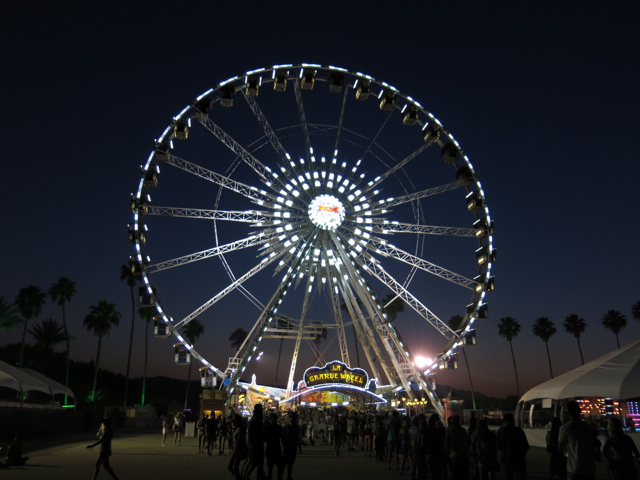 One day eh…. That other traditional Malaysian breakfast. Fueled up and ready to go, our next stop was the century old Kwong Fook Temple, also known to locals as Si Yeh Kong. 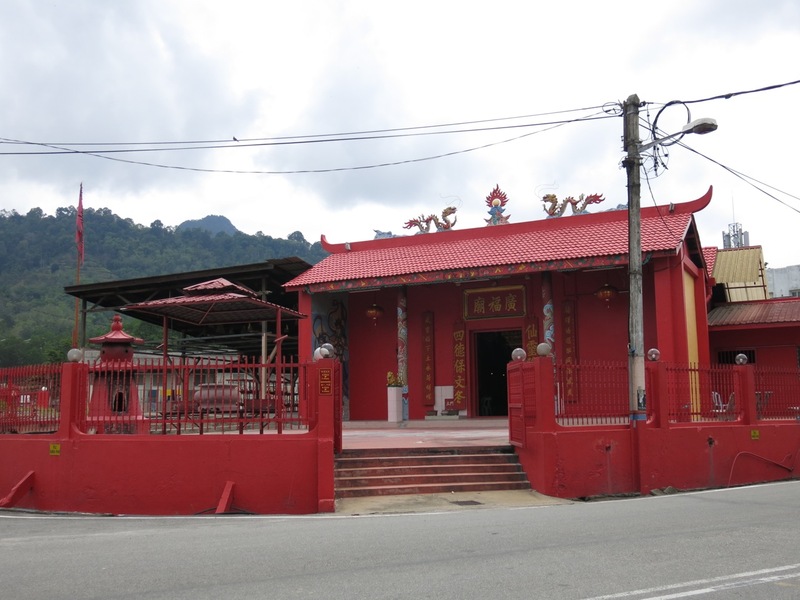 The burning incense coils I used to spot when driving through Bentong were absent from the temple today but inside the vast space a bright yellow board with what appeared to be numbered tickets caught my attention. As it turned out, as Richard translated for me, it’s used in a fortune telling ritual. Being neither religious or superstitious, I’m not a believer in fortune tellings and readings, but seeing as we had been so kindly welcomed into the sacred space, I thought, why not? It’s part of the experience. Facing the alter, the temple custodian rhythmically shook a cylindrical container of sticks until one dropped to the floor. The number inscribed on it divinely directed her back to the yellow board and specifically to one piece of paper detailing my fortune, which as it turned out was pretty positive – I was promised a reasonably good year, my guardian angel would assure it. Thanks mum! 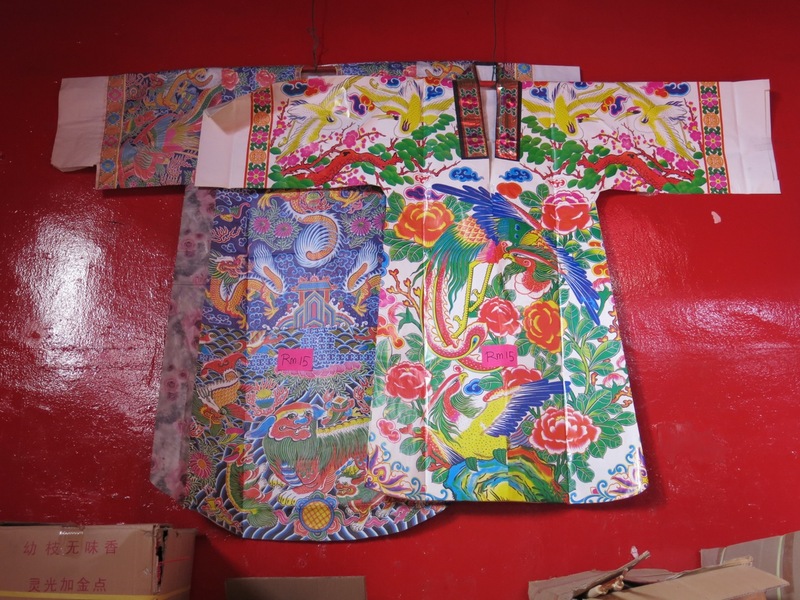 I made a small donation and before we left, I purchased these pretty paper robes. I was assured they weren’t used in any ceremonies and are sold to raise funds for the temple. Good to know as I didn’t want to inadvertently insult anyone’s religious or cultural practises. Thinking they make great decorations for the house I picked up one of each design. It was hot now. To cool ourselves down for the walk back to the truck to drop of our purchases I suggested stopping for ice cream. 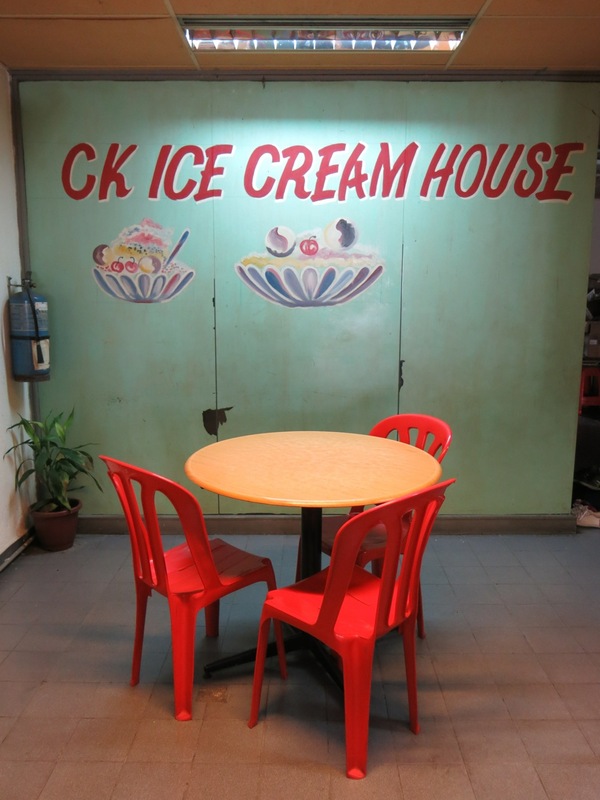 There are 3 well known ice creameries in Bentong: Kow Po, Tak and CK, the former being the most celebrated. But as CK was closest we headed for that. The flavours offered are limited, but the durian, which we both opted for, was delicious and pretty potent. Cheap thrills – only RM1.20 for a generously sized scoop of durian ice cream. It was while we were engrossed in licking our spoons that we heard the sounds of sirens. 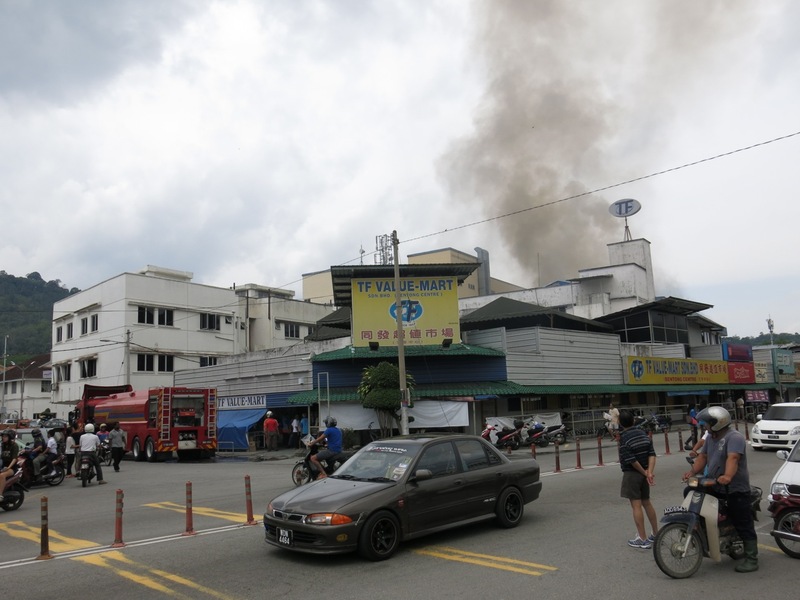 We assumed it to be an ambulance as Bentong Hospital is located nearby, but having popped his head outside to look, the Uncle told us it was a fire. Bystanders try to get a closer look from beside the public toilets. Turns out a blaze had broken out in the storage room of the TF Value Mart where stock is kept. Dark plumes of smoke billowed from the roof even as we arrived but 2 fire engines were on the case and from what we gathered no one was injured. 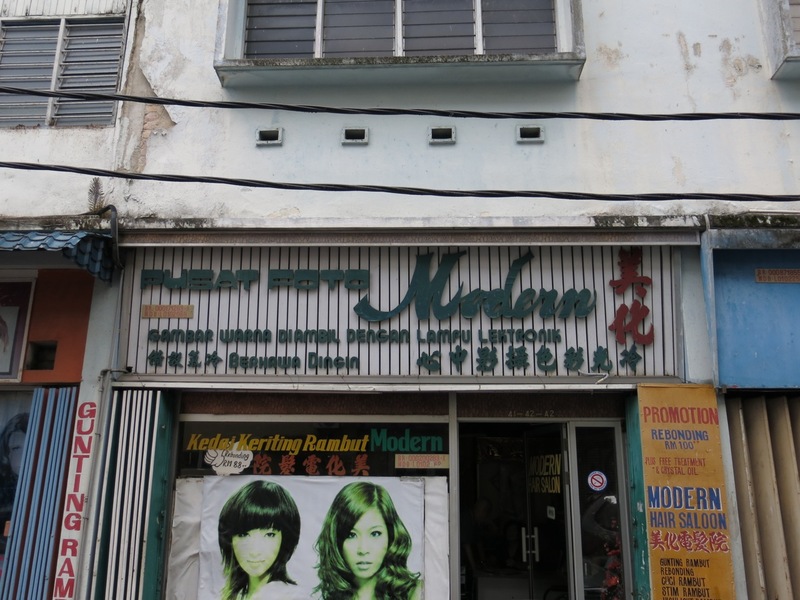 With the power cut to some shops, there would be no blow dries today. The disaster had disrupted the electrical supply to shops nearby though. 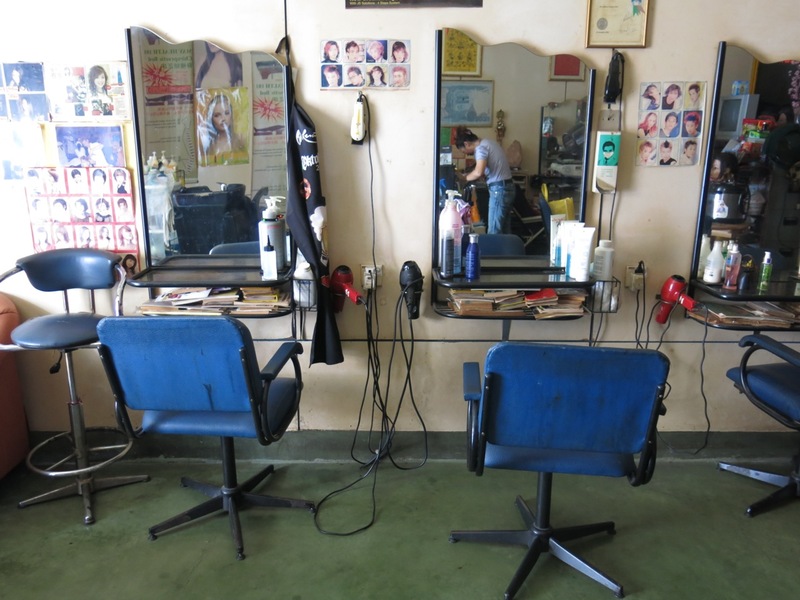 No wonder the jovial lady boss at the hair salon had invited us inside to chat…. At the Hindu temple at Jalan Pasar. Done with rubber necking and small talk, we continued our quest for lunch. Noticing a small crowd gathered around one of the stalls, we followed their cue and ordered up some Yong Tau Foo and supplemented it with a hot bowl of yee wan (fish paste) soup from neighbouring Kedai Kopi Kwong Sen.
With the sun now at its hottest we decided to ditch the streets for the coolness of Chamang Waterfalls, a 10km drive away. 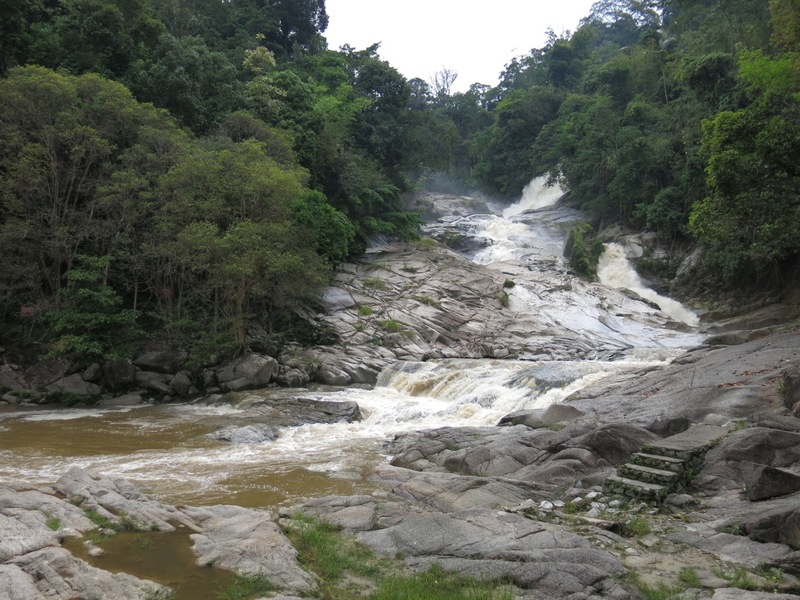 Tall, wide and incredibly powerful, particularly after rainfall, the falls are impressive and deaths from being swept away or drowned in the currents are not uncommon. We climbed the embankment but dutifully stayed a respectful distance away from the water’s edge – the yellow flag was up, caution advised. 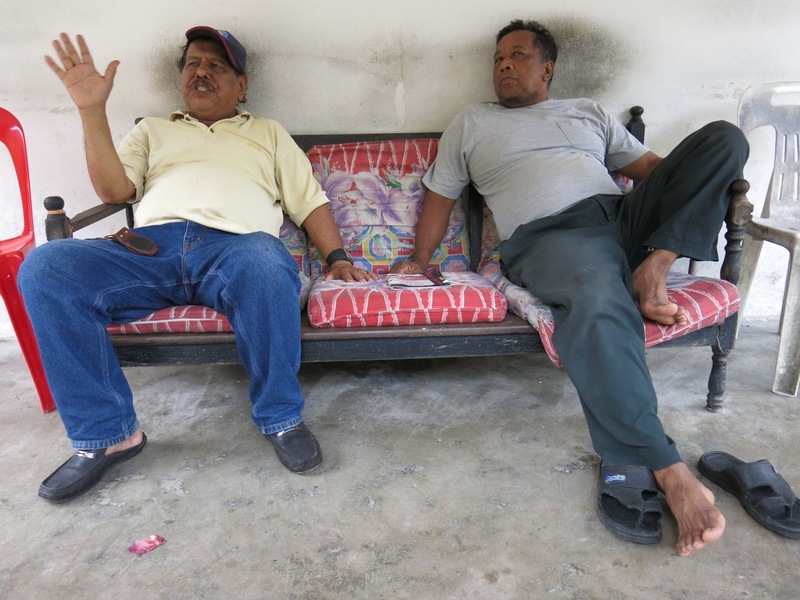 As it was a weekday the place was deserted, save a family and a group of friends and these two men (pictured), who we struck up a conversation with, mostly about politics. 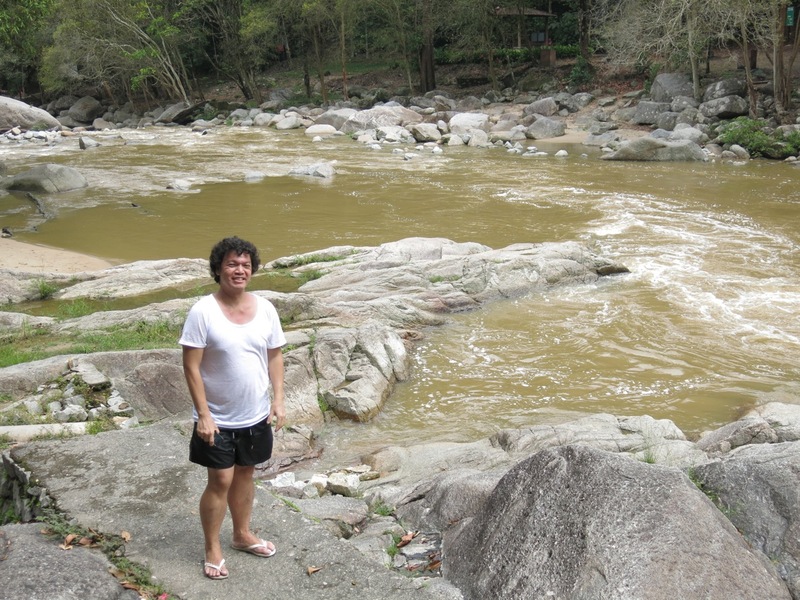 On a weekend the place teems with families who come to bathe in the cool gushing waters and picnic. Excursion over, we return to Bentong to explore Kampung Perting, a photogenic Chinese settlement of approximately 3,000 people. 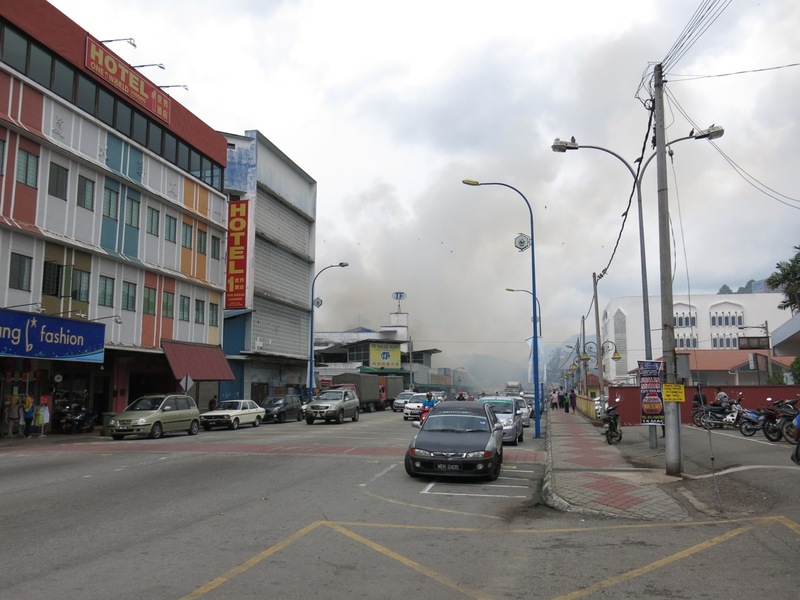 Kampung Perting’s volunteer fire brigade, just back from fighting the blaze at TF Value Mart. 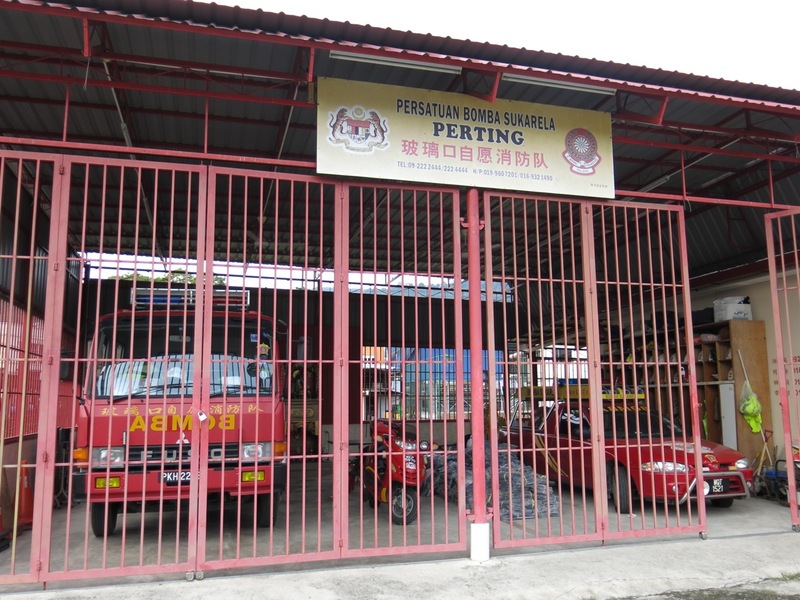 Set on the other side of Sungai Bentung, despite its proximity to Bentong’s Old Town Kampung Perting has its own school, police station and volunteer fire brigade, which makes perfect sense as the village is a maze of closely packed wooden houses and streets with no street name, just a number tacked onto the front of house numbers. Few houses have a garden but those that do utilise their small plots to grow fruit and vegetables, and flowers are planted along the village’s roads. 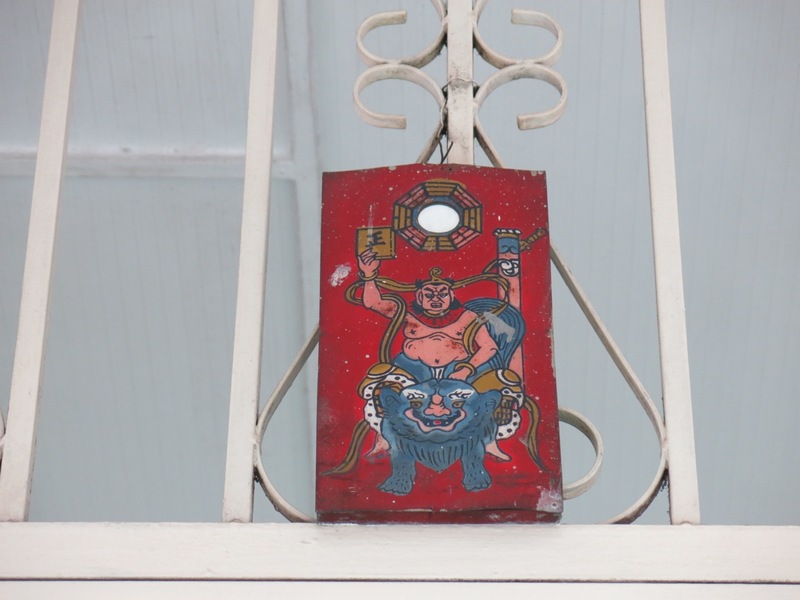 It’s quite charming and would make a great place for to experience an authentic Chinese homestay. While we had hoped to stay for dinner, but still full from lunch and not helped by a kaya puff and yam balls purchased from a passing roti man, Richard and I decided to call it a day. 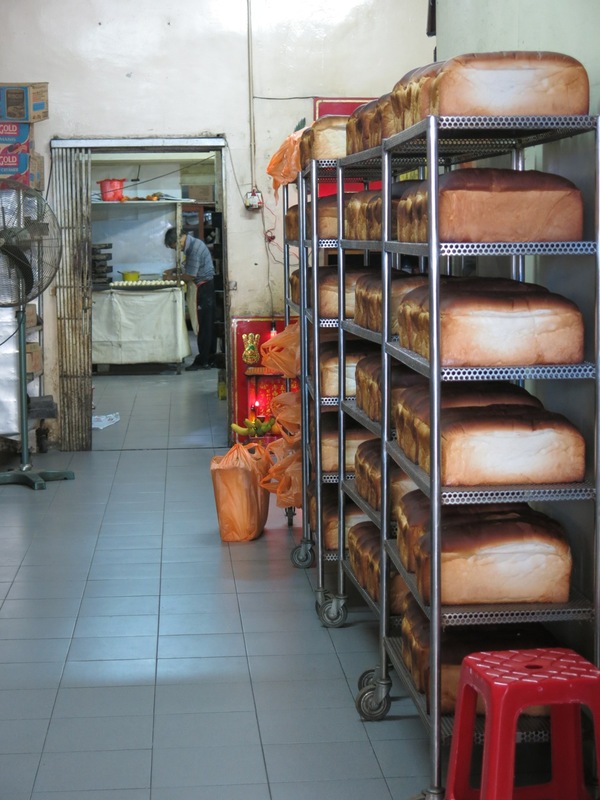 Just one last stop to make: to Weng Fatt’s old school butter cake and bread shop for some freshly baked bread. The alluring smell of freshly baked breads beckoned us to come inside. 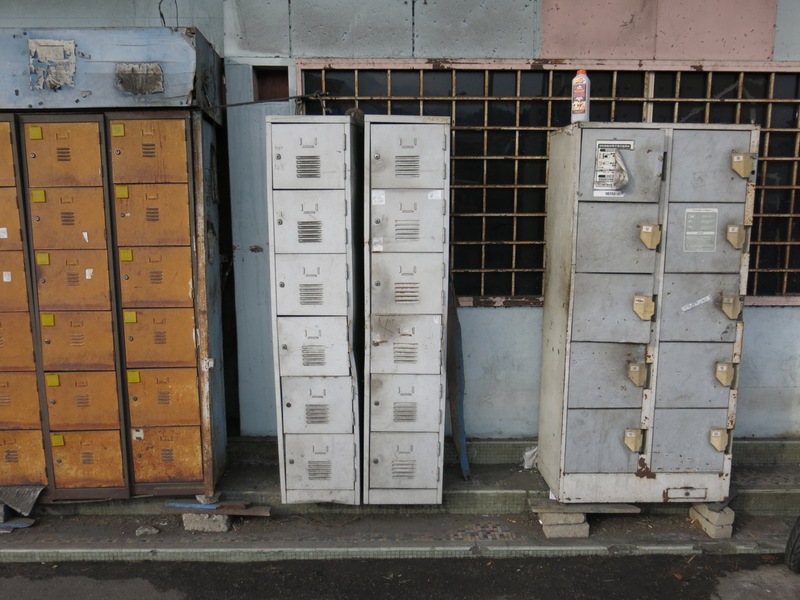 In operation for more than 60 years, Weng Fatt’s freshly baked goods are distributed throughout Bentong. Richard picked up a sliced white loaf for home, and with that we headed home. 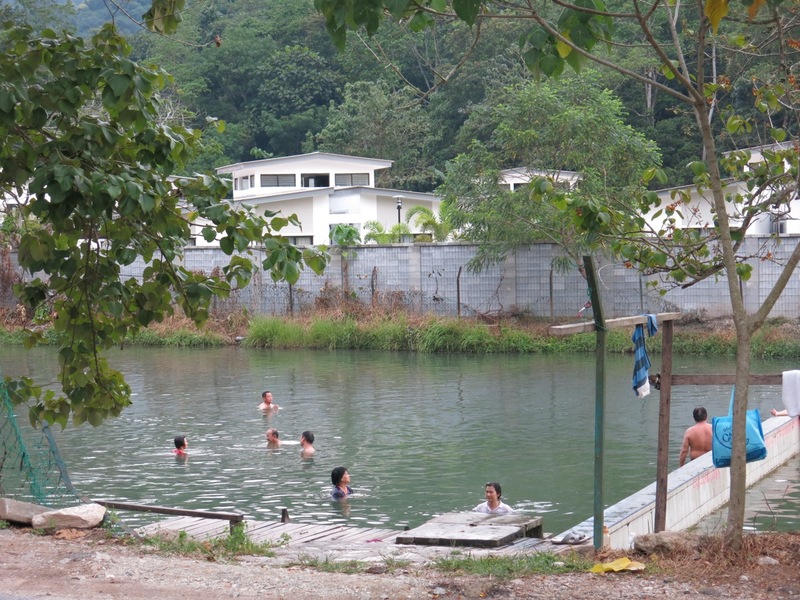 But, not before stopping by Bentong Hot Springs. The hotter of the two pools. After all that walking, what a treat to take a dip. 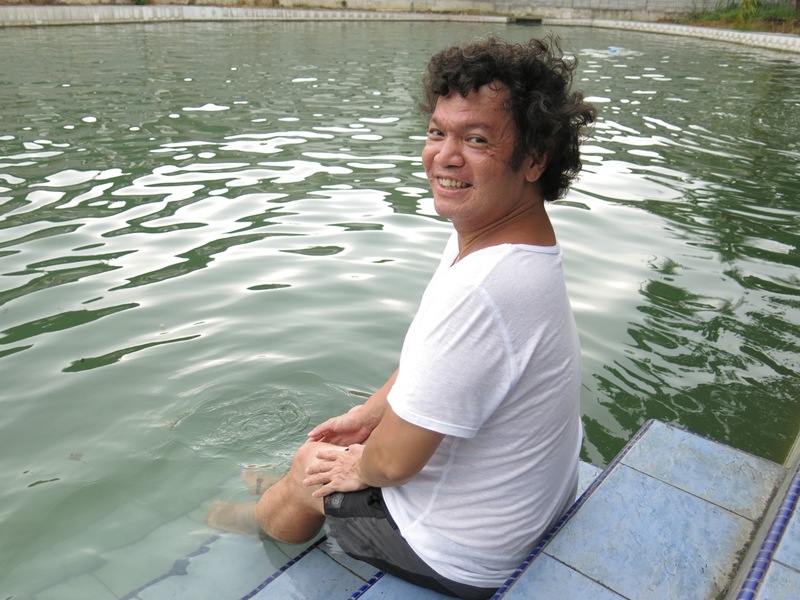 Located along the old Gombak road, midway between Bentong and the Bukit Tinggi exit, the hot springs had changed considerably since my last visit; Suria Hot Springs Resort had taken up residence behind the twin pools. This public section is free to access, if a little basic, but as Richard and I sat there testing the temperatures with our feet and watching the heat bubble up from beneath the waters, we realised sometimes the most unassuming places hide such lovely treasures. That’s Bentong for you. Very charming. Feels like stepping back in time. 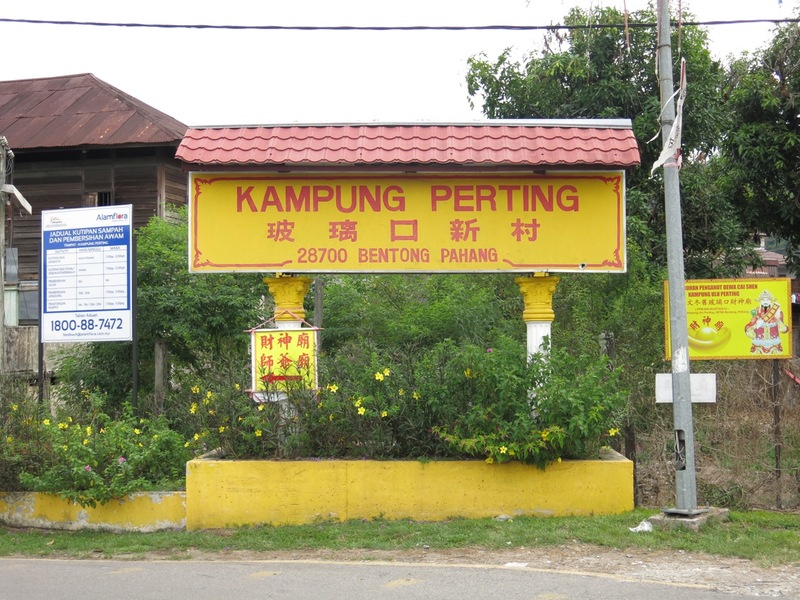 I’ve never been to Bentong. So near, yet so far. You have to come with us next time we visit. Excellent piece of work indeed. 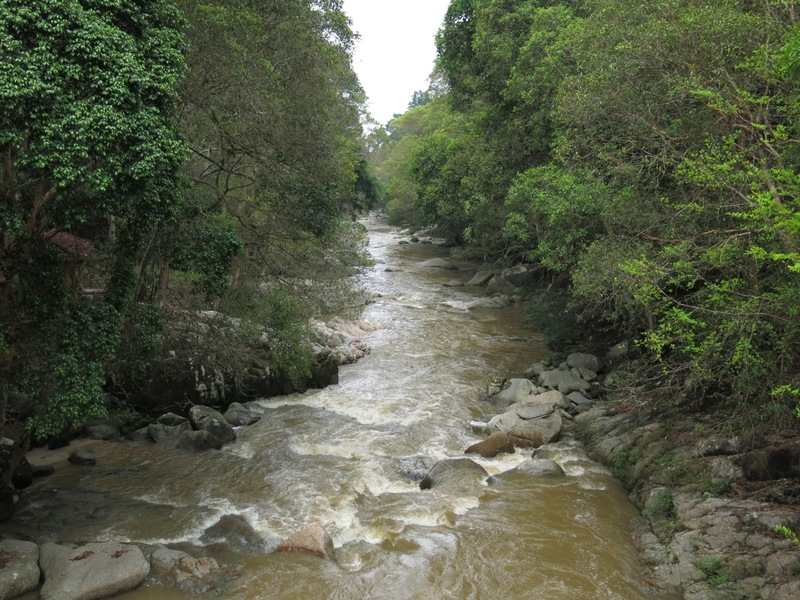 It has described Bentong in such a marvellous way. 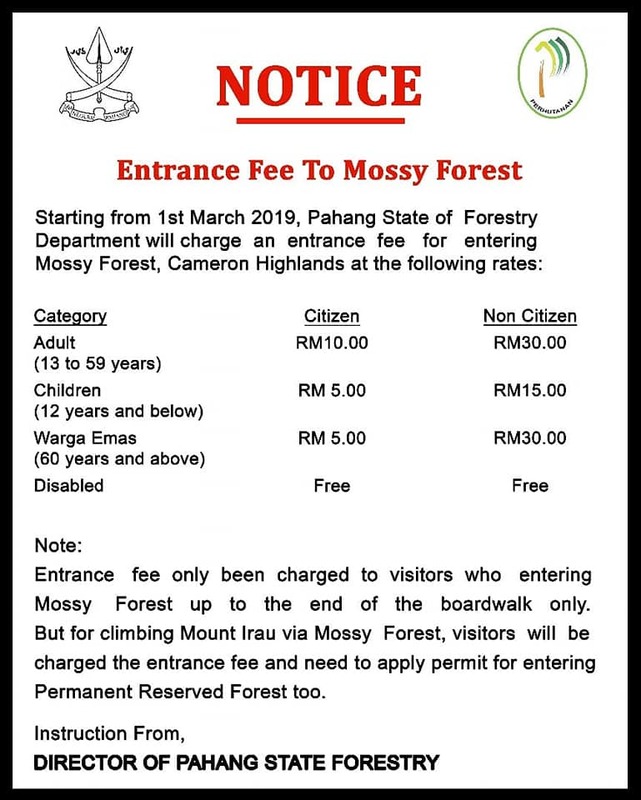 However, there is one significant location that was missing in this write-up which is Bentong Gallery. This gallery that was officially opened in July 2017 is a unique place. It not only display and describe the brief history of Bentong, it also house a nice and cosy cafe. 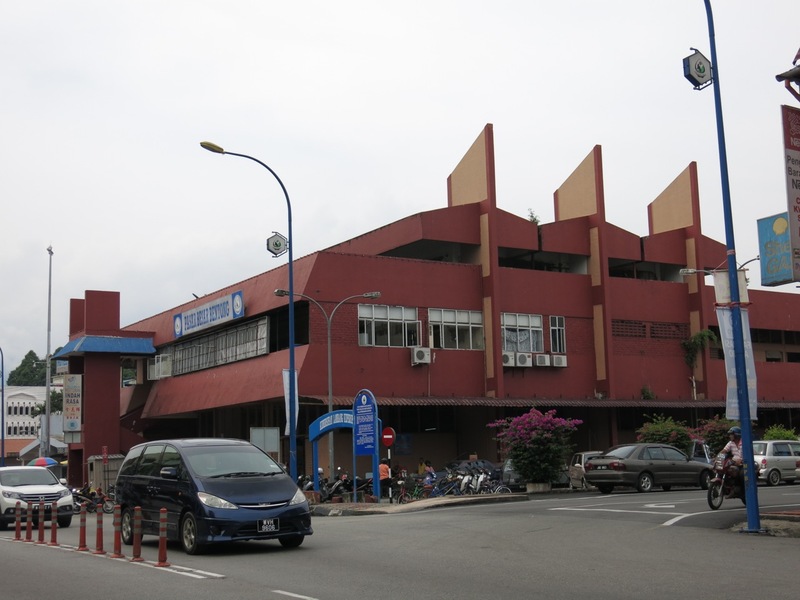 It has a products centre that promote Bentong specialty and souvenirs. It would be great if Bentong Gallery can be featured by your esteemed media to attract more people to Bentong. 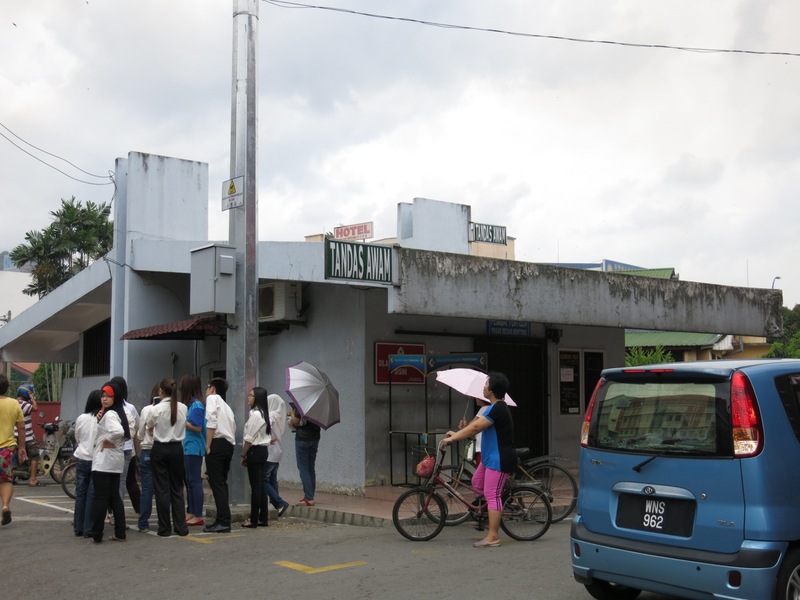 Their visit to this small town will never be the same after visiting Bentong Gallery. Hi Eddie, thanks so much for your kind words and for reading. 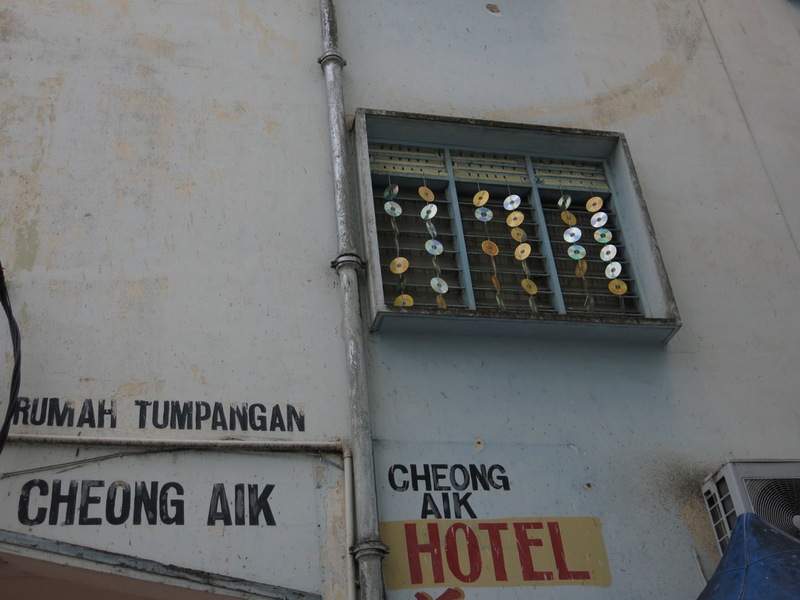 When I wrote this, judging from the dates the Bentong Gallery was not yet open but now that it is, it certainly calls for a return visit to this fantastic town. Thanks for letting me know, I will definitely check it out soon.